It has been suggested that the installation and opening of the M&G will make a great story for a documentary – let us know if you have any contacts in these areas. This will certainly be a significant achievement once completed to be enjoyed by thousands of Kiwis attending the Passchendaele Centenary Commemorations and into the future. The site is in a magical and peaceful spot in the bush, serenaded by blooming mauve rhododendrons. The poppy-shaped garden already has a flagpole with a New Zealand flag flying. I have no doubt that the Memorial & Garden will become a ‘must-see’ on everyone’s European itinerary in the future! The 2016 AGM was held at the Auckland War Memorial Museum Auditorium on Thursday 31st March. Numbers of attendees were down a little this year, but were sufficient enough to manage to get through all the necessary votes. There were no changes to the Board. We then enjoyed a moving speech by Mark Ingram, the grandson of Monty Ingram. Here is a small excerpt from his speech:- During that month, Grandad’s Ruahine Company of the Wellington Battalion was reduced from 120 to 30. These were my Grandad’s friends, they were his companions, he shared his life with them – ate every meal together, walked every mile, prayed every prayer, shed every tear, laughed at every joke, together. All the while knowing every breath could be their last. The bond would have been incredibly strong. Then in an instant, gone. Not only killed in their prime, but gruesome deaths right in front of his eyes – one suffocating into toxic mud filled craters surrounded by dead and decaying corpses groaning for help, another blown apart by shellfire, another had limbs torn apart by high calibre machinegun fire, another his chest pierced through by an advancing German with bayonet extended. Why am I being so graphic? Because unless we reflect upon the horror, we cannot fully comprehend the sacrifice, the agape love these men had for one another . As my grandad looked upon his dead friends, friends who would have been closer than flesh and blood, knowing they died so he might live, how would he have felt? He couldn’t put in writing his true feelings. Clearly too traumatic to record no doubt. His good friend Stan, now suddenly in the prime of their lives, he’s gone in an instant. Blown apart. Never to enjoy family and friends again. Never to marry, nor have children, or grandchildren. No future. No legacy, other than the final act of sacrificial agape love for his fellow soldiers. Le Quesnoy, France November 2018 A proposed permanent memorial installation to commemorate the New Zealanders’ liberation of Le Quesnoy. The Passchendaele Society Board expressed our horror at the terrorist attacks which took place in Brussels. We offered our condolences to the Belgian Consulate in Canberra on the lives which were lost and advised our deep sympathy and support for the people of Belgium in these tragic circumstances. Our members join in commemorating the memories of all those who lost their lives in the First World War in the hope that such tragedies would never happen again. The peace movement which we know to be so strong in Belgium will we feel use this terrible happening as a reason to strengthen their resolve. The Iron Poppies for Ieper project is appealing for funds worldwide. A very large single Flanders Poppy will stand 7m tall and 2m wide, surrounded by a field of 2016 steel poppies created by several contributors from around the world. Initially it will be erected in front of the Flanders Fields Museum in Grote Markt Square, Ypres, from 1st to 6th September, 2016. It will then be moved to a permanent position adjacent to the German War Cemetery at Langemark, Poelkapelle. It will commemorate the sacrifices made on all sides during the WW1 conflict in Flanders. Go to www.ypres2016.com to find very comprehensive information about this. The WW1 Memorial Forest at various locations around the Coromandel is a great initiative. Visit http://www.tcdc.govt.nz/ww1memorialforest to learn more. For only $25 you can ‘buy’ a tree in memory of a specific New Zealand soldier who died in the Great War. In return you will receive a Memorial Certificate with the soldier’s name and the GPS co-ordinates of the tree. The Passchendaele Society has subscribed to The Last Post Association in Ypres for the years 2016, 2017 & 2018. The Last Post Association has been responsible for the remembrance ceremony and sounding of the Last Post at the Menin Gate every night since 1st July 1928, which many members have witnessed and appreciated over the years and which others will no doubt do so during the forthcoming centenary commemorations. The Board therefore considered it appropriate to take up membership of the Association for the next three years, as a token of recognition of the valiant task they have performed over 30,000 times. New member Rev Margaret Williams has kept us up to date with the progress and design of the new Passchendaele window at the All Saints church in Kaeo. Kathy Shaw has been chosen as the designer and work is expected to commence shortly. The window will be visible from the highway for all to see as you head north! An on-stage Scottish Tattoo will be held at The Aurora Centre’ Burnside High School, Christchurch on Waitangi weekend Sat 4th Feb 2017. The Tattoo will have Pipes & Drums, Highland Dancers, Country Dancers, Marching Team, Sword Fighters, Scottish Fiddler, Haggis Ceremony, Brass & Wind Band and from Edinburgh an entertaining duo replicating the halcyon days of Andy Stewart, Harry Lauder & Jimmy Shand. There will also be a ceremony for the centenary of the Battle of Passchendaele with the Honorary Consul of Belgium as guest of honour. NB The Theatre only has 700 seats and there is only one show, so this Tattoo will book out very quickly. Tickets are $49 (+ booking fee) and will be on sale only by Ticketek. We are often asked about upcoming commemoration events planned in Belgium. 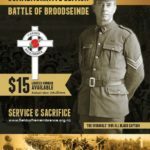 This website is an excellent source to stay abreast of any developments in Zonnebeke/Passchendaele http://passchendaele2017.org/ Also the http://thebelgianshavenotforgotten.blogspot.co.nz/ is a great source of information. The Auckland Field of Remembrance was again erected in front of the Auckland War Memorial Museum in April. Last year saw 829 crosses erected commemorating the Aucklanders that died in 1915. This year saw another 857 erected commemorating the Aucklanders who died in 1916. They all served with Auckland regiments or came from the wider Auckland area. Most died on the Somme, with many also falling around the Armentieres Salient area. Click here to view Maori Television’s report. We are of course holding our annual commemoration again this year on October 12th at 11am at the Auckland War Memorial Museum, please write it in your diaries! The Passchendaele Society commemorates all those that lost their lives on the Western Front at this commemoration. 100 years ago in April the bulk of the main body of our NZEF troops arrived in the South of France. Over 20,000 troops, together with 3,200 horses entered through Marseilles, some parading through the streets greeted by the welcoming French. To mark this special anniversary a ceremony was conducted at the Mazargues War Cemetery: http://ww100.govt.nz/service-of-remembrance-mazargues-war-cemetery. June 7th saw the 99th anniversary of the Battle of Messines in 1917 come and go without a mention. However it was June 17th 1916 when the first Australians were killed in Flanders near Messines (i.e. 1 year before of the Battle of Messines). They were commemorated in ceremonies both at the Menin Gate in Ypres and at the Australian War Memorial in Canberra. May 31st was also significant as it was the 100th anniversary of the Battle of Jutland, the largest naval battle of WW1 which included the services of HMS New Zealand. However the Battle of the Somme is the most important commemoration this year, a National commemoration will take place on September 18th at the Pukeahu National War Memorial Park in Wellington…..more details soon. There is also an 11am service at the Auckland War Memorial Museum on September 15th in the WW1 Sanctuary. Or if you are in Europe, there are three Commemorations planned on September 15th in Longueval, France – a 7am Dawn service at the New Zealand Battlefield Memorial, an 11am service at the Caterpillar Valley Cemetery and a 7pm sunset ceremony at the New Zealand Battlefield Memorial again.